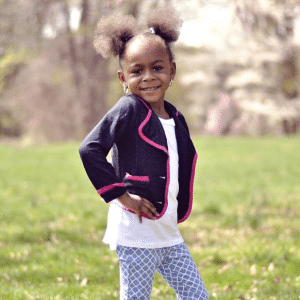 Meet Aniya, a kindergartner at St. Athanasius, who loves to ride her bike and loves her mother’s cooking! She is looking forward to meeting new friends this year. Aniya’s mother, a tuition-based school alumna, praises the benefits of private school for her daughter. A: Play with my best friend Madison, ride my bike, and go to Chuck E. Cheese’s. A: Religion, I like to hear about God and read. A: My mommy. She can cook and she works hard. A: To meet new friends. A: That she succeeds in whatever she decides to do. Aniya is a bright child with a bright future. As a single parent who was adopted, I want her to have the same opportunities I had and more. A: St. Athanasius has been nothing more than an amazing place for my daughter. She is in kindergarten, and to see how advanced and how knowledgeable she has become in the first 100 days of school has made me proud to send her to such a great school. The classes are the appropriate size and her teacher works very hard to provide them with one-on-one learning and makes sure to send home personalized notes to update me on how she is doing. A: As a product of a tuition-based school, I believe that attending a tuition-based school gives my daughter an opportunity to have a greater learning experience than her peers in public school. There is more attention paid to the children and the teachers and principal work very hard for the children. I also believe they are more advanced than other children, and I am an example of that. A: I was excited and blessed that God would give this to me! I know that I would do whatever it takes to make sure my daughter has the best education possible. A: It helps to take the stress off of trying to find ways to afford a private education for my daughter. I am forever grateful. A: Apply, pray and be grateful if you receive it . It is an opportunity of a lifetime and there are people who are not so lucky to receive it.